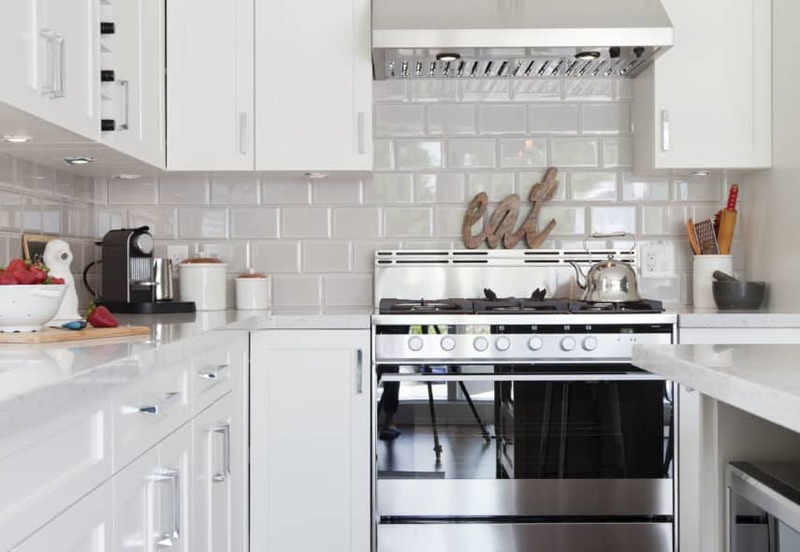 Jessica & Derek | Love It or List It Galleries | Merit Kitchens Ltd.
Jillian and her Love it or List it Vancouver team convinced Jessica & Derek to love their house again – it must have been the Snow white and Haze gray Shaker kitchen by Merit! The cabinets showcase the designer favorite Manor Flat, Painted MDF door style, and the unique, double-stacked flat crown moulding extends to the ceiling, lending a sense of modernity not offered by angled crown moulding. Finally, a wine rack placed amidst the run of wall cabinets provides decorative relief.